Aoe trying to get some easter food! 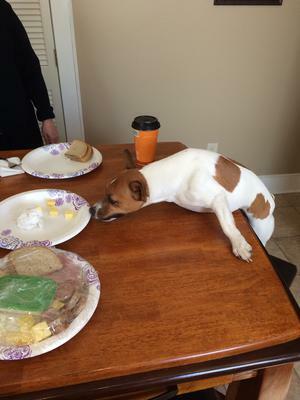 Aoe is going on 4 years old in November, and she loves to join us at the table so now when someone gets up she likes to jump up and try to steal something off the table. Here we tried to stop her but she continued to stretch herself so far without jumping on the table she almost looks like a Seal!